Americans are a salty bunch. Literally. Salt, and the sodium it contains, saturates the American diet. And that’s a big problem. 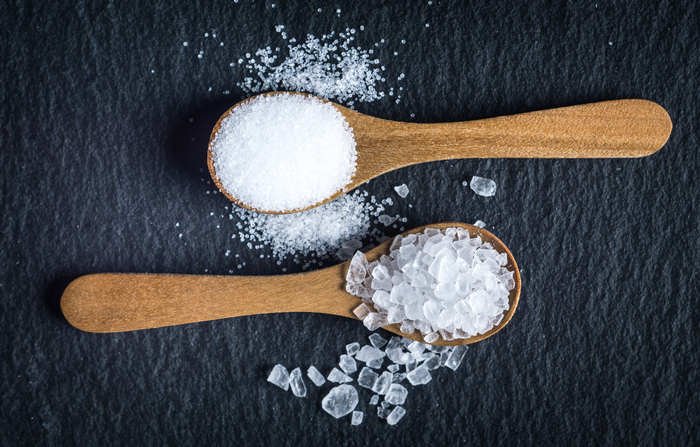 According to the Food and Drug Administration, 90% of American adults and children consume more than the recommended amounts of sodium via their dietary salt intake. The average U.S. adult ingests 3,400 mg of sodium per day, far above the American Heart Association’s (AHA) recommended daily allowance of 1,500 mg of sodium. This much salt does more than make you feel bloated. Excess levels of sodium can cause cardiovascular disease, most notably high blood pressure, which raises your risk of stroke. High sodium intake can also lead to kidney disease and kidney stones, and has also been linked to stomach cancer. Hypertension, the medical term for high blood pressure, is known as the “silent killer” because its symptoms are often unnoticeable—until it’s too late. High blood pressure occurs when the systolic measurement (mm Hg) is 130 or higher and the diastolic measurement is 80 or higher. The AHA estimates that 103 million U.S. adults suffer from high blood pressure, which is nearly half the country’s entire population. Deaths resulting from high blood pressure increased 38% from 2005 to 2015, and health experts say those numbers continue to go up. Every year, about one million Americans die of heart attacks or coronary heart disease and nearly 800,000 men and women suffer strokes, according to AHA statistics. That’s a huge price to pay for consuming salty foods. But avoiding sodium—and flushing it from your body—is a bit more complicated than simply swearing off pretzels and throwing your salt shaker in the trash. The truth is, salt is so prevalent in the American diet that you need a strategy to help flush out the sodium that your body is going to absorb no matter how strictly you adhere to your eating plan. After all, you don’t live under a rock. Many social occasions will find you consuming something that may be problematic if you have issues with hypertension. This is where a steam room comes in. Steam therapy’s deep flushing abilities will help you decrease buildup of dangerous sodium, while offering other benefits that contribute to a better overall health profile. But before we get into the magic of steam, let’s drill down to the basic facts of sodium and all the ways you can protect yourself from the silent killer. Here’s a brief primer on salt and sodium. Are salt and sodium the same thing? Not exactly. Sodium chloride is the chemical name for salt, and while they aren’t precisely the same substance, the terms are often used interchangeably. In fact, the Nutrition Facts Panel on labels may use “sodium” while the front of the package will say “no salt added” or “unsalted.” About 90% of the sodium we consume is in the form of salt. How much sodium is in salt? A teaspoon of salt contains about 2,300 mg of sodium. Does sea salt have less sodium than common table salt? No. They taste a bit different, but have the same amount of sodium by weight. Most sodium we eat comes from processed foods and restaurant food. More than 70% of sodium consumed by Americans come from these sources and not from dinner-table salt shakers. And very little of the sodium we ingest is the result of salt added to home cooking. You have many options in countering excess sodium consumption, many of them based on simple common sense. But some solutions to excess sodium may not have occurred to you, and that includes using a steam room to flush out sodium and other toxins. With that in mind, let’s look at five ways to combat the scourge of sodium. Limit sugar-sweetened beverages and sweets. The Mayo Clinic has sample menus for you to get started. Too much salt makes you bloat because your body dilutes the salt to keep you hydrated. Drinking water helps flush sodium from your body. One study found that increasing consumption of 1-3 cups of water daily lowered sodium intake by 78-235 g each day. That’s significant. The common mineral potassium can help counteract sodium consumption. In short, the more potassium you eat, the more sodium you release through urine. The recommended intake level of potassium is 4,700 mg daily. Foods such as bananas and sweet potatoes are especially high in this nutrient. Research shows that exercise reduces the impact of sodium on the body. Specifically, the study found that those who had the most physical activity had a 38% lower risk of being salt sensitive than those who got the least amount of exercise. Of course, ask your doctor if you are healthy enough for exercise before you begin any exercise program. While multiple mechanisms may be at work in the effect of exercise on sodium levels, one way physical activity helps expel sodium is by sweat. And that brings us to our final item on the list. Simply sitting in the relaxing environment of a steam room may help you flush sodium out of your body, while also delivering other potential benefits that could improve your overall wellness. Here’s why a steam room should be part of your wellness strategy. Steam Helps Remove Sodium Through Sweat! It starts with the simple process of sweating. Experts say you lose an average of 500 mg of sodium in one pound of sweat, with the total range of 220-1,200 mg. This is significant, especially if you have regular access to a steam room. If you make a session in a steam room part of your daily ritual—and it only takes about 15 minutes per session—then you’re already at an advantage if you were relying only on exercise for your sodium-flushing benefits from sweating. Just remember to always drink plenty of water before and after using a steam room. Since physical activity is a key attribute of your sodium-reduction strategy, keeping your body in its best condition is important. Steam rooms may help you stick to your exercise schedule by possibly helping the body recover from strenuous activity. Research has shown that hyperthermia consistent with steam room temperatures may help reinvigorate muscles and help accelerate recovery. Increasing exercise capacity will help you avoid overtraining and injury, and keep you committed to your active habits. One of the ways to improve your overall cardiovascular health is through improved circulation. One study found that blood flow out of the heart “increases by two or more times” after a 10-to-15-minute exposure to a hyperthermic environment consistent with steam rooms. Other research found that steam heat may dilate small blood vessels. Studies show that steam therapy may also remove dangerous metals and other toxins from your system, along with sodium. One study found that excessive sweating can also remove cadmium, mercury, arsenic, and lead. If sweating from a steam room can dig down deep enough and possibly help remove these chemicals from your bloodstream, think what it may do for your sodium flushing. Another study with police officers found that hyperthermia treatments helped remove dangerous methamphetamine elements from those who had absorbed the chemicals during the execution of their duties. These detoxification effects helped the officers recover from illnesses suffered from the exposure. As you can see, healthy eating is only part of your battle against high sodium. The truth is, avoiding salt in your food isn’t always easy. Our lifestyles don’t always allow us to avoid eating out and consuming processed foods with heavy sodium content. That’s why flushing sodium, removing it from your body before it does damage, should be part of your overall wellness strategy. Let a steam room do the work for you and help you in your fight against high sodium and the scourge of hypertension.